Keeker has always dreamed of owning a pony; she’s read every book and took riding lessons every summer but it seemed like it would never happen. Then one day Plum cantered into her life, thanks to her mom and dad. But it wasn’t as easy as she imagined. Plum didn’t want to ride with her right away, and she wasn’t easy to pet or play with. Finally, when riding day comes, Plum pushes her luck and winds up throwing Keeker off in the woods. It takes coming to understand how to interact with the pony for Keeker to be able to gain the trust of Plum and ride her back home safely. An easy reader book with some illustrations on most pages and large font to instill confidence in beginners. 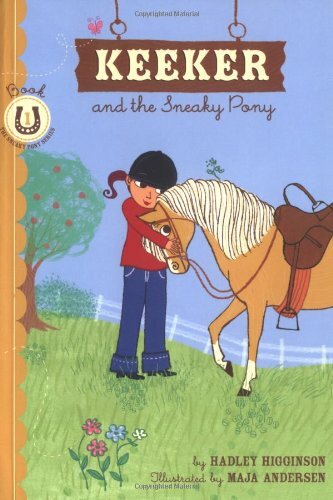 This book focuses on the thoughts of two characters, Keeker and Plum the pony, as they learn to understand each other. The language is simple and the chronology is straight forward, broken up in to small chapters. The message taken from the book is one of navigating a new friendship and learning to be patient with animals. Good book for girls interested in horses, especially as the book features a “Pony Facts” section at the end. It also imparts good messages about friendship and family. Matsuoka, M. 2007. Footprints in the snow. NY: Henry Holt and Company. Wolf was curled up in his house on this cold winter night looking through his shelves for a nice book on wolves. All the wolves in his books were nasty, scary, greedy and mean, so Wolf decided he would write a book about a nice wolf. He wrote about a wolf one winter morning who left his house for a nice walk. When he spotted footprints, he decided to follow them to find out who left them. None of the woodland creatures he encountered, however, would tell him who left the footprints; they all thought he wanted to eat the source of the prints. Finally the wolf found the source, a duck who was swimming in the pond. Despite his best intentions, wolf began to imagine how tasty that duck might be. Suddenly, Wolf awoke, and he was no longer writing a book; he was taking a bath! 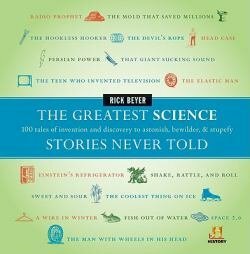 Thankfully his story didn’t end like all of those other stories with mean wolves. But when there was a knocking at the door, he was surprised to find a set of prints, leading into the woods, and he wondered whose they were. Beautifully illustrated, this picture book illustrates how sometimes you can’t escape your own nature. Wolf certainly can’t – even when he tries to write a book about a nice wolf, he comes to find that nice wolf still wants to eat ducks. The chronology in this book can be a little complex, as the wolf goes from writing a story, to suddenly being in the bathtub, to being presented with the same scenario that began the book ending it as well. The language is simple and the font is big, often curving with the action on the page. The narrative follows just the wolf, although it is a little bit unclear whether the wolf in the actual book and the wolf in his story are one in the same. Learning about animal nature, how the wolf is not necessarily “bad” for following his nature. Can also be used in conjunction with other books that feature wolves to talk about tropes of good and evil, how wolves are often featured as evil/conniving characters. Cummings, T. 2013. 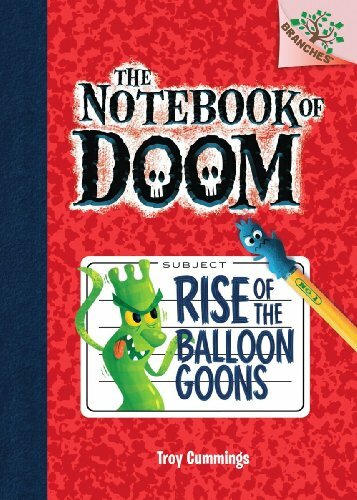 Notebook of doom: Rise of the balloon goons. NY: Scholastic Press. Alex Bopp is new to town and understandably, he’s a bit nervous about being the new kid at school. What he doesn’t expect is all of the weird things he encounters in Stermont. Balloon goons are rampant on the street, those rubbery flappy guys with their big goofy faces. Alexander finds a notebook filled with drawings of monsters. Flat tires seem to be everywhere. Then, the school isn’t even where it says it is on the map! And when he gets to class, he’s given a horrible nickname by the teacher. Alexander finds himself trying to face his greatest fears all in the span of a few days. A compact chapter book brimming with doodles and illustrations that enforce the “notebook” aesthetic. The illustrations are very dominant in this book, making it a good bridge from picture books into chapter books, lending confidence to less experienced readers. The monster notebook is represented by doodles and graph paper inserted into the narrative. The narrative structure follows one character on a simple chronology of a few days, making it low complexity. The language and sentence structure is simple and straightforward,appealing to less confident readers. Good for new students, and for facing fears. The “monster notebook” provides a good format for students to document their own kinds of monsters, learning how to describe animals and creatures by physical characteristics and their environment. Florian, D. 2003. 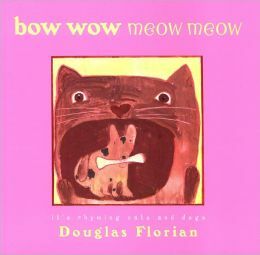 Bow wow meow meow: It’s rhyming cats and dogs. NY: Harcourt Books. These colorful poems introduce young readers to a wide variety of dog and cat breeds through rhyming poetry. Learning about poetic structure as well as animals through these poems. Learning onomatopoeia concepts through the poems in this book. Using these poems as a starting point for students to write their own poems about animals in their lives. This website allows kids to browse countries by name or by continent. Each country opens a new page with facts about the country, pictures, videos, an E-Card, and maps. This website could be helpful to students in World History or World Cultures classes, as it provides basic reference facts and colorful overviews of many countries. The facts range in text complexity according to readability-score.com, so while I think this is a middle-school level reference, some of the information may need to be reinforced by a teacher.